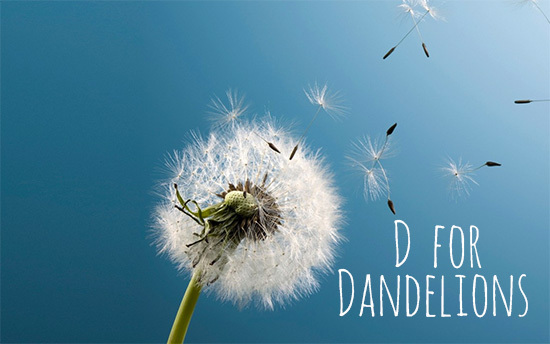 This week’s letter is D and we’ll make dinosaurs, dominoes and dandelions! We’ll have sequencing ( story ordering ) and sequencing ( math and language ) activities. We’ll explore gourds and pumpkins and use both for classifying and sorting and counting. Science activities will include hands-on lessons on sink or float and push and pull. At circle time we are talking about the weather and change of season, reviewing letters and numbers, learning to recognize and spell our names and listening to stories! We will be sorting by length and height. We will be counting 1-10. We will be continuing to learn the days of the week. “D” words, color match, shape match, number maths and days of the week. We will read at least one story each day. Have each child take off one shoe. Place the shoes in the middle of the room. Have the child place one hand on a sheet of construction paper and trace around it. Then ask the child to think of five special things about his or herself. Example: The child could say, “I have blue eyes”, “I can stand on one foot”, etc. Write each thing the child says on one of the fingers on the hand print. Later, let each child hold up their hand prints, while they tell what is written on each finger. Ask each parent to bring in pictures as them as a baby, toddler etc. Let each child share with the class. Encouraging washing of hands when using the bathroom. We had another successful week in the Pre-K 2’s class. We learned about the letter B and the sound it makes. Please make sure to ask your children what sound it makes. Next week we will continue to work on sharing, sitting during circle time, the days of the week and the months of the year. I will also introduce the letter C and start some cool fall projects. We’ll review A and B and introduce the letter C. We’ll experiment with colors ( primary and secondary ) and begin to recognize and learn color words. We’ll practice writing Cs and numbers 1,2 and 3. Using colorful pompoms, we’ll work on counting (1- 15 ) and sorting and patterning. We’ll make name “constellations” with bright gold and silver stars. For science, we’ll make our own weather booklets and work together to prepare, observe and describe liquids that don’t mix! We’ll make a healthy snack with bananas and granola using measuring and counting skills. We’ll make ” word family ” caterpillars (- at and -op). We’ll have a lesson on beginning sounds (B, C and D), matching the sounds to items in our room. Using connecting blocks we’ll learn about syllables and then do a syllable search (1-, 2- and 3 – letter words). This week we will focus on learning to say” please” and”thank you”, listen and sit still during story time. Each child will draw a picture of their friend. English – We are working on letter “C” and its sound, naming as many “C” words as we can. Math – We will be sorting by size. We will be counting 1-10. Circle Time Activities – “C” words, color match, shape match, number maths and days of the week. We will read at least one story each day. 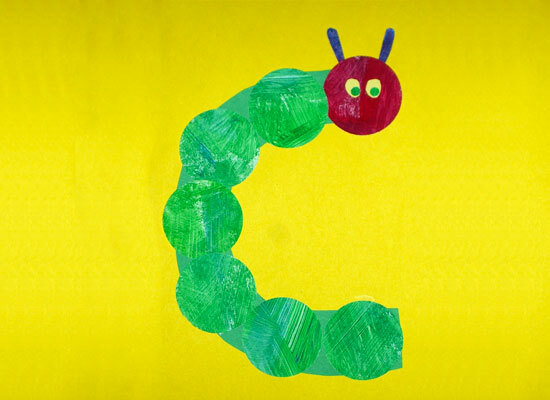 We will make a caterpillar from circles and a paper plate cat to link with “C”. Health – Encouraging washing of hands when using the bathroom. Next week we will be learning about the letter B. Projects for the week will include a color review and some letter B projects. We will continue learning many new songs, the months of the year and days of the week. This week we finished reading The Kissing Hand and had fun talking about summer activities vs. fall activities. The children loved the scavenger hunt on the playground. We even had a little picnic. Your sweet children have been sitting the majority of the time during circle time and learning the morning circle routine. During morning circle time we cover, days of the weeks, months of the year, shapes and colors. I would like to work on name recognition next week and we will learn all about the letter A. This week we will continue focus on learning to share, say” please” and”thank you”, listen during story time and sit still when appropriate. We will also practice taking turns through various games and activities. 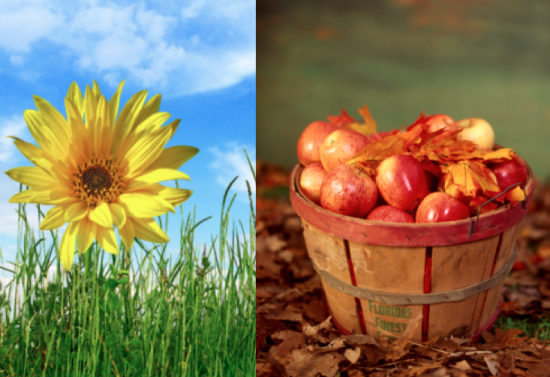 We will be comparing differences between Summer and Fall through books and photos and outside observations. English – We are working on letter “B” and its sound, naming as many “B” words as we can. Math – We will continue sorting by shape then by colour. We will be counting 1-10. We will be learning the days of the week. Circle Time Activities – ” B” words, color match, shape match, number maths and days of the week. We will read at least one story each day. We will collect B objects to to put into a box. We’re getting acquainted and reacquainted with our friends and getting back into the rhythm of school! We are working on letters A and B and numbers 1-15. We are reviewing shapes and colors as well. Using name cards , the children are learning the spelling of their names and their classmates’ names. Circle time activities have included Applesauce As, color match, number math(one-to-one correspondence), days of the week, months of the year, seasons and weather reviews! We read at least one story each day as well. This week we’ll have lessons on rhyming and positional words.We’ll use colorful blocks for counting and making sets. We’ll taste apples and use slices and seeds for a math lesson. We’ll make and snack on our own apple pies! Next weeks theme is about summer activities vs fall activities! we are going to read books about going to the beach! We are going to have fun with sand sensory bins! Your sweet children will talk about apple picking and even do one of their art projects with an apple! We are going to read one of my favorite books, The Little Yellow Leaf By, Carin Berger. The two’s class will be going on a scavenger hunt on the playground to locate essential summer and fall items like, sun glasses, shorts, sun tan lotion, sweatshirts and vests to name a few! English – We are working on letter “A” and its sound, naming as many “A” words as we can. We are learning some nursery rhymes. We will be sorting by shape then by colors. We will be counting 1-10. ” A” words, color match, shape match, number maths and days of the week. We will read at least one story each day, often related to letter A. We will collect A pictures to make a mini collage. This week we’ll have lessons on rhyming and positional words. We’ll use colorful blocks for counting and making sets. We’ll taste apples and use slices and seeds for a math lesson. We’ll make and snack on our own apple pies!